There were rumors saying that the Meralco Bolts made an offer to Air 21. They are willing to trade Sunday Salvacion and Mark Cardona in exchange for Air 21’s Nelbert Omolon, John Wilson and a future 2nd round pick. The Air 21 Express has yet to see the the Bolts’ offer. But, if ever they will accept it, Mac Cardona will be reunited with his college coach, Franz Pumaren and his long time college teammate, Mike Cortez. That looks favorable to Cardona. 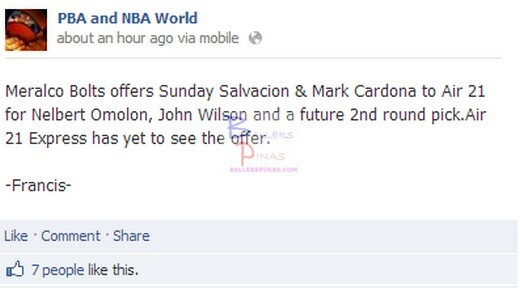 There were also rumors that Mark Cardona was thrown out in one of the practice sessions of the Meralco Bolts. Could that be the reason why he’s on the trading block?